Beijing, January 11, 2019 - Asian Private Banker, a renowned private bank and wealth management research house in Asia Pacific, awarded CreditEase Wealth Management the Best Wealth Manager for Digital Innovation, the Best Wealth Manager for High Net Worth Services, and the Best Wealth Manager for Alternative Advisory and Excellence Wealth Manager (China Domestic categories). The Asian Private Banker Awards for Distinction 2018 are designed to recognise private banks and independent wealth management firms for their achievements within a given year across: market segments, business and operations, client services, and investment solutions. 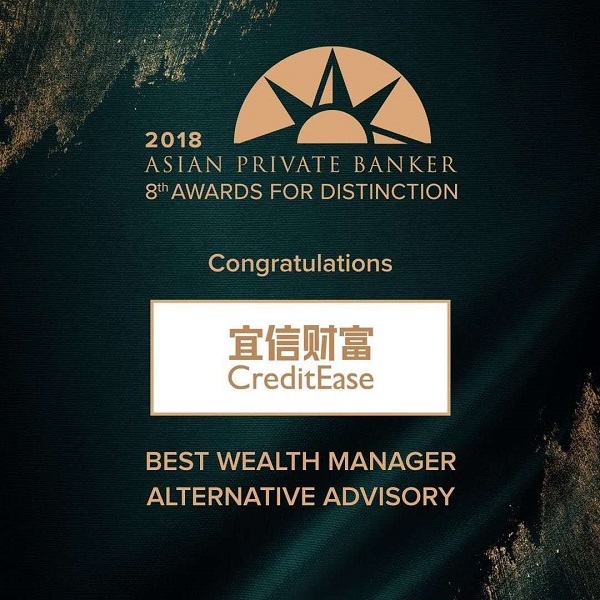 In addition to repeating last year’s Excellence in Wealth Manager award (China Domestic category), it was the first time for CreditEase WM to participate in other awards and to be recognised for its high-quality business growth, strong value propositions, innovation achievements, and investment service and education capabilities. As a leading independent wealth management institution in China, CreditEase WM has always been committed to providing comprehensive wealth management solutions and investment services to HNW clients, based on the concept of asset allocation. Building on a foundation of investment capabilities, international resources and technology strength, CreditEase WM is dedicated to being a long term partner for clients. “CreditEase WM provides professional services, which greatly helps our clients solve three major pain points - business digital remodeling, investment and succession. Our “Three Golden Principles for Asset Allocation” remain a cornerstone for our wealth management business, and we continue to support our clients with cross-region allocation, cross-asset-class allocation, and having an overweight position in alternative assets via FoF (Fund of Funds), with a view to achieving attractive long-run investment performance.” Miss. Hou added. “As a longstanding member of the FinTech industry, the spirit of digital innovation and research is institutionalized throughout CreditEase, and we have been committed to developing strong technological capabilities, and using science and technology to promote financial innovation and wealth management. As an example of how we integrate digital innovation in our wealth management business, we developed the “AI + FoF” system, utilizing machine learning for data storage, sorting, structural analysis and real-time tracking. This innovation was implemented to improve FoF managers’ investment capability and management capability.” Miss. Hou described. The Asian Private Banker Awards for Distinction are the most informed and arduous global private banking and wealth management awards. Since 2011, the world's only dedicated team of private banking and wealth management journalists, analysts and researchers have set the benchmark for excellence in private banking and wealth management in the most important growth regions: Asia and the Middle East. In 2018, over 150 institutions and departments submitted pitches and applications for the 8th Awards for Distinction, and over 300 CEO's, founders and C-suite leaders will join the Black Tie Gala Awards Dinner on February 21st in Hong Kong. Established in Hong Kong in 2009, Asia Private Banker is well regarded for its independent and authoritative coverage of the rapidly growing private wealth management industry in the region. Its information and data are often cited by the global and regional financial media and consulting firms. In 2011, the media launched awards for private banks, wealth management institutions and other organizations with private wealth management functions in Asia-Pacific, aiming to set industry benchmarks and share best practices through professional, independent and rigorous selection process. CreditEase WM, a subsidiary of the leading fintech company CreditEase, is dedicated to being a top wealth manager for Chinese communities worldwide. The company hires nearly 2,000 relationship managers/financial planners across over 100 retail outlets in more than 40 cities in mainland China. Additionally, CreditEase WM has opened branches abroad in Asia, Europe, and North America. As of September 2018, the company serves more than 50,000 HNW clients and several hundred thousands of mass affluent clients, with an AUM exceeding RMB150bn. CreditEase WM also offers one-stop service to all customers' financial needs to UHNW clients, and this is growing multiple times faster than the whole company. Investment services we offer consist of global asset allocation, investment management, and investment consulting. We cover a wide spectrum of asset classes including domestic and offshore quasi fixed income, private equity, public equity, hedge fund, real estate, and etc. Our life services include investment-based immigration, direct real estate investment worldwide, family trust, insurance planning, tax planning, estate planning, education planning, and philanthropy. Currently, CreditEase WM is the sole domestic firm helping clients set up family trusts both onshore and offshore. Asia Private Banker has the world's largest and best-connected bureau of journalists and researchers delivering independent, authoritative and indispensable intelligence, data and connections solely focused on private banking and wealth management in Asia and the Middle East.